While perusing Facebook one day I ran across photos of this INCREDIBLE dress. 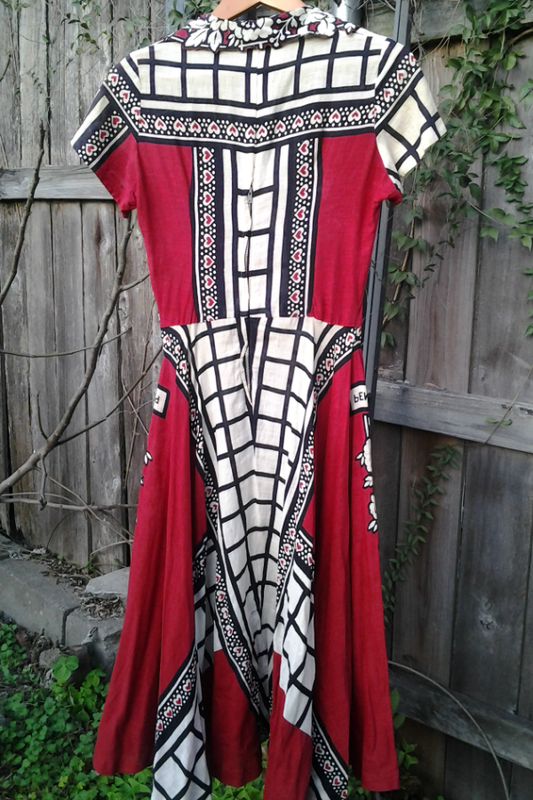 It is the epitome of intercultural vintage, a holy grail of clothing! 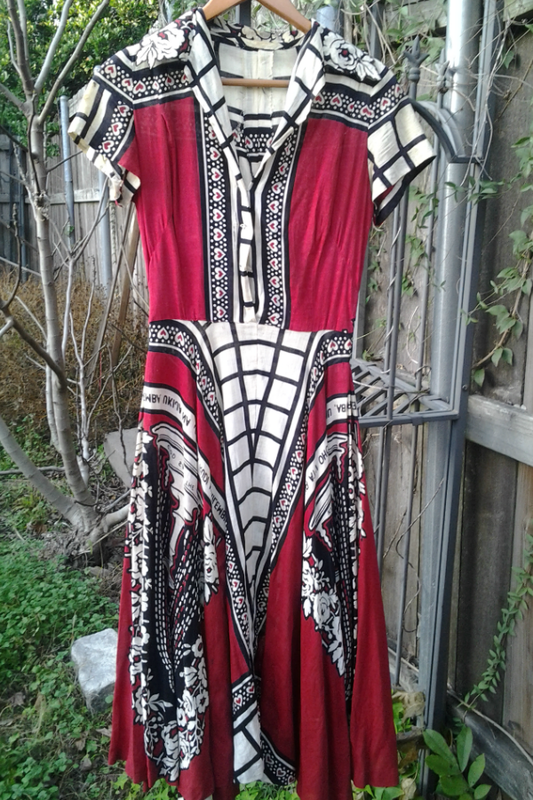 You all know how much I love combining vintage and different cultures, and this dress is a real vintage example of someone else who had the same idea! Its owner, Robyn, was kind enough to take a few photos for me to share with all of you. A bunch of us in a couple Facebook groups have analyzed it, and I can't wait to share all the cool details with you! We know this dress came from the estate of a wealthy lady. (She had lots of designer labels for sale, too!) My guess is that this lady traveled to Africa and found this fabric, or perhaps a loved one of hers did and brought this back for her. We aren't able to see the entire proverb, so "Pemba" is a word we have put in as a guess, but the idea of it is very similar to a Swahili proverb that mentions Pemba Island. The letters in the wrinkles on the bottom left have the right arrangement to say, "Pemba peremba" or "Visit Pemba carefully," too, so that's how we're going to fill in the blanks! Proverb kangas are still common in East Africa today. We can also confirm the time period it's from by the "God Save the Queen" phrase on the bottom, possibly making this a commemorative piece for Queen Elizabeth II's coronation in 1952. 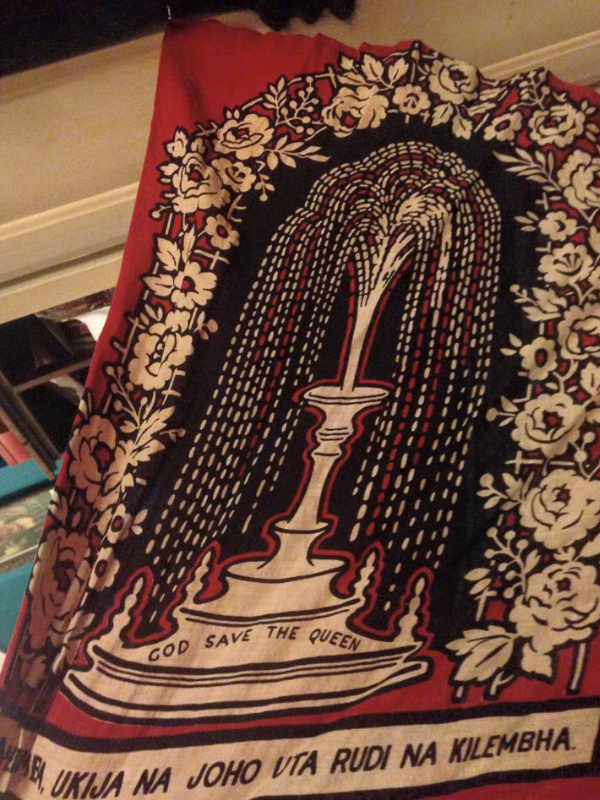 (King George VI ruled before her, so a pre-1952 fabric with "God Save the Queen" on it wouldn't really make sense. Anyone from the UK can feel free to correct me on that if that's a wrong assumption!) Either way, it's at least from 1952 or a bit later. I also date it to the early to mid 1950s because of the dress details. It has softer shoulders than the late 40s, but it still has a short zipper at the waist, not a step-in zipper like was used more often in the 60s. The almost-a-full-circle skirt and longer length also points to an early 50s "New Look" style. Out of these, only three speak Swahili widely: Kenya, Uganda, Tanzania. The idea of the proverb talking about Pemba Island points to it being Tanzanian or Kenyan, since Pemba is right off the coast of both. (Pemba Island wasn't officially joined to Tanzania until the 1960s, so we can't be sure!) Both countries create fabrics like this still. 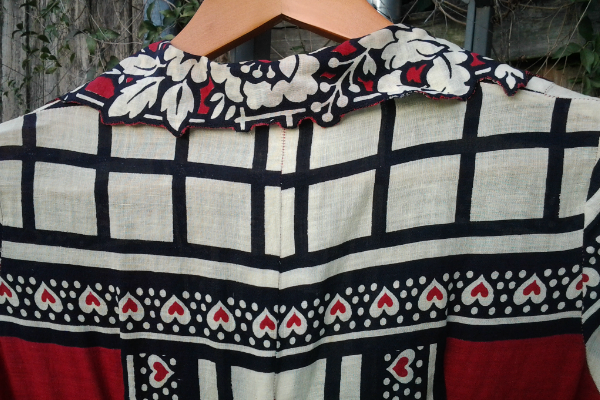 So this is how we have somewhat solved the mystery of this amazing, 1950s Kenyan/Tanzanian kanga frock! It's such a great example of how cultures affect each other: a British event commemorated in African-style cloth, made into an early 50s Western dress. And the details! Look at the amazing collar, the symmetrical placement of the print; I'm very inspired! I especially call this intercultural because it really is a blend of two cultures. It isn't an African-themed novelty print where Westerners portrayed Africans; it takes actual African art techniques and combines it with events in the West. You know what's even cooler? Modern kangas still have commemorative prints like this. There are even American president versions with George W. Bush's and Obama's faces on them! Thanks, again, to Robyn and all my Facebook peeps for sharing the dress with me and helping to solve this mystery! 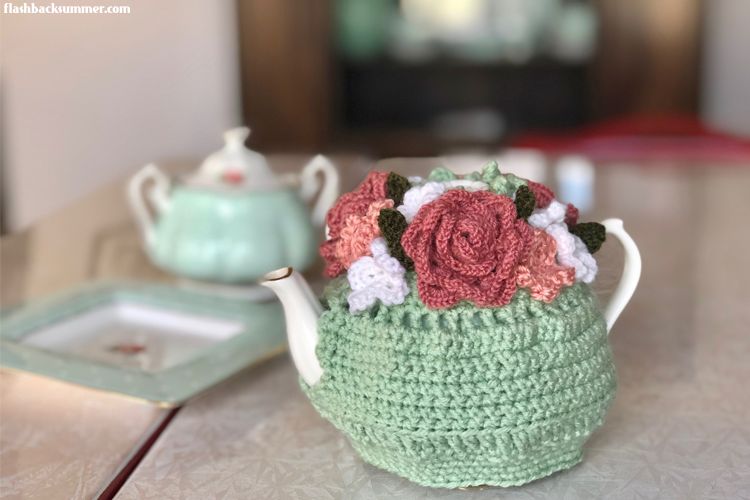 Have you ever seen/had a piece of intercultural vintage? What do you think of this one? How old do you think the dress is? That's really interesting! And it would definitely have to date from the time since Queen Elizabeth II took the throne in 1952 - while the wife of the king is titled Queen, nobody would say "God save the queen" in reference to the king's spouse. She was actually in Kenya when her father died and she ascended to the throne. OH MY GOODNESS! I totally didn't know that! That adds even more credibility! I was thinking Kenyan simply because there seemed to be far more Brits there than other parts of Africa, but this info could definitely add to the Kenya case! Quite possibly. I think it was something of a point of pride for the area that (a) Princess Elizabeth was visiting there to begin with, and (b) she became Queen Elizabeth while there. It would make a lot of sense that they would produce some form of souvenir for the occasion. Of course, Kenya is a favorite of the British royalty even today - William and Harry both like to spend time there and William even proposed to Kate there. What a neat piece of history! I think that your guess is right on with the date. The silhouette, zipper insertion, and skirt shape all point to the early to mid 50's. 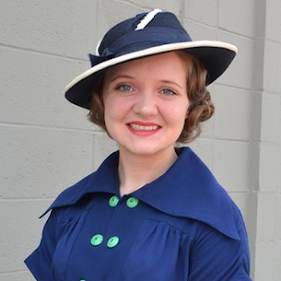 That's a really cute dress, and a fascinating history behind it! Your guess of the 1950s seems about right, given all the clues. I love the analysis that you did of the dress. That's really fascinating! It's a beautiful dress, and it's wonderful that you could figure out so much about it. That dress is so cool!! I love all the thought put into design placement- very original and interesting- it almost seems like the fabric was designed for that bodice! And the collar is too perfect! Thanks for sharing all the history and deduction involved in the dress- it was fascinating! I actually have a bunch of kangas my mom brought back for me at Christmas, so while I won't be doing the exact same thing, you will be seeing kanga clothing on the blog, especially for summer! WOW, that dress is really a fascinating piece of mystery history! It's like detective work! You've done a great job, and like another poster has said, Elizabeth came to the throne in 1952 so that's the earliest date it would be. What an inspiring, stunning dress. Thank you for your awesome detective work and for sharing this beautiful dress with us. 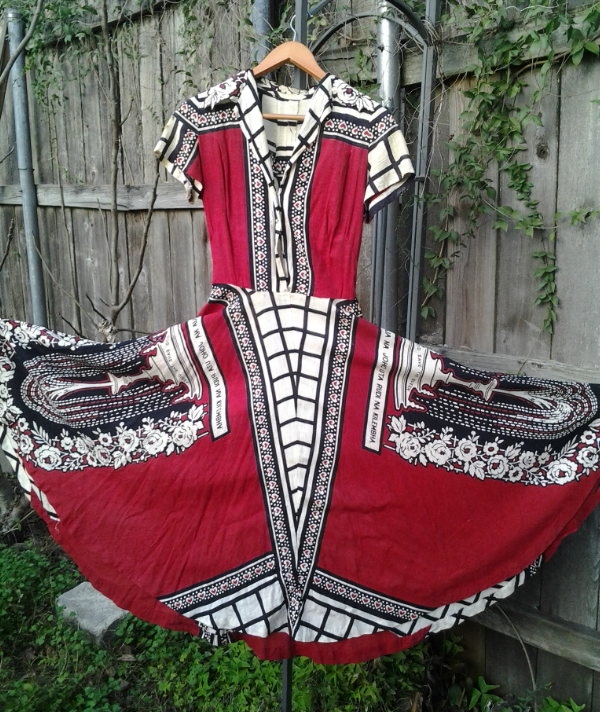 I adore vintage clothing with ethnic elements to it as well. My grandmothers friend has a couple of Obama khanga dresses from when she was in Kenya during the first election. I'd love to own one myself, I've been considering adding some African garments into my wardrobe. Your detective work was great! It's super super gorgeous!! such a great dress and such a wonderful post about it. thank you so much for sharing!!!! What an interesting piece of clothing, it was fascinating to find out all about it. So cool! What a great investigative and cultural post! This is so cool,I simply adore that dress! I have quite a collection of kanga and have been studying them for a while now. There is a possibility that this kanga was actually printed in India. I would be able to tell you more if somewhere on this dress, the bottom edge of the original kanga is still intact. There is usually print on the bottom that will tell which textile company it was printed at. Often there is a design number as well. The design itself was created in East Africa, the the actual place of fabrication will remain in question without the information that would have been on the lower right or lower left of the kanga. That's good to know! Unfortunately, this isn't my dress, so I won't be able to check the kanga for more info. But if I run across any older ones, I'll definitely check them! 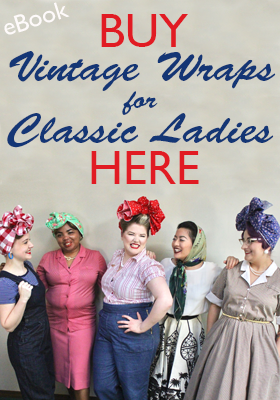 Also, if you'd ever like to write up a post sharing some info about vintage kangas, I'd love to see what you have!